H.A.L.F. : The Makers follows two groups of protagonists under the threat of an alien race. What direction did you want to take this novel that was different from the first book in the series? The first book deals mainly with the idea that the aliens known as the Roswell Greys (those ubiquitous big-eyed, bulbous-headed aliens) are the alien threat. Book one brings the reader in with familiar imagery and ideas such as the Roswell crash, the Greys and government conspiracy reminiscent of the X-Files. In The Makers (book two), my goal was to expand on the familiar alien mythology. I introduced my own alien species as well as my own ideas about the Roswell Greys. This expanded the story significantly. Books two (The Makers) and three (ORIGINS) are more epic in scope than in book one (The Deep Beneath). The characters in this novel are once again intriguing and well developed. Who was your favorite character to write for? Thank you for that compliment! 🙂 I enjoy writing all of the characters and especially had fun creating the sexual tension between Jack and Anna and also between Erika and Tex (though their tension really amps up in book three ;-). But overall, I most enjoy writing in Tex’s perspective. Given that he’s only half-human, it’s fun spending time in his head! I like seeing our world through his eyes. Tex has strange, other-worldly experiences with the Regina and the Conexus in The Makers. Those scenes were creepy and fun to write! And his story grows and gets even better, I think, in book 3 (ORIGINS – releasing 8/24/17). I thoroughly enjoyed the well crafted mystery and the detailed characters. What is your writing process like? Thank you, again, for your kind words. My writing process is messy! When I first began writing fiction, I outlined extensively. I was an attorney for 20 years, so planning was in my nature! But after writing two or three novels, I found that I no longer followed outlines I created. The more experience I get as a writer, the more I focus on character development in my pre-write planning. I write back story, flesh out motivation and details about the characters. For both The Makers (H.A.L.F. #2) and ORIGINS (H.A.L.F. #3), I did not outline the plot. I have a general idea—beginning point, middle point and end point. I focus, for each POV character, on what needs to happen for this character for the story to end. For The Makers, because there are two separate plot lines, I wrote the Tex and Erika portions all at once, then the Jack and Anna portions, then the U’Vol chapters. I then had to thread them together. Phew! Writing in this way takes quite a bit more time than following a detailed outline. I generally cut anywhere from 20,000-50,000 words and have to rewrite and revise for months. But I think that because I don’t pre-plan, the story has more surprises than if I planned it all out. When I’m in the flow, the story goes in unpredicted ways. I hope that readers enjoy the unpredictability and surprises in the plot. What are some writers or books that you felt inspired you and this series? I was inspired by George R.R. Martin’s Game of Thrones. I know that may sound odd given that the H.A.L.F. series is young adult Sci-Fi—no dragons! But I read all five of the GoT series while writing book one (The Deep Beneath) and I was inspired to make the H.A.L.F. series into a more complex story. Most young adult books follow a single protagonist, often told in first person, and generally in a fairly linear fashion. I wanted to push the boundaries a bit and write a YA book with multiple storylines and point-of-view characters. This idea was in direction reaction to my love of G.R.R.M’s writing style. I was also heavily inspired by Chris Carter’s work in the X-Files. I tried to emulate the creepy vibe of the X-Files as well as drawing out the mystery the way the X-Files did. You think the “bad guy” is one person, but it may turn out to be someone else—or something else—entirely. Readers of the H.A.L.F. series won’t know all of the answers to the many questions raised until the very end of the series! And I think they’ll be surprised by how it all turns out! 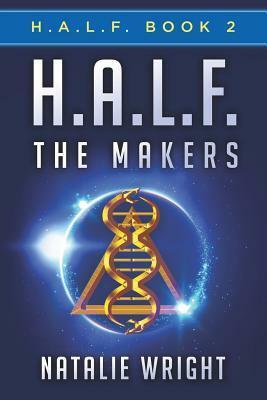 “The Makers” is the follow-up to Natalie Wright’s multiple award-winning debut science fiction novel “H.A.L.F. : The Deep Beneath.” “We’ve seen grey aliens on T.V. and in movies. We may think we know all about them. But what if everything we think we know is wrong?” Erika Holt dodged death and departed Earth in an alien ship. It wasn’t how she’d planned to spend her senior year. Is Erika on her way to paradise? Or to a hell worse than the underground lab she escaped? The greys rescued Tex from A.H.D.N.A. and promised him a life he could never have imagined. But what will he have to give up to become one with The Conexus? Jack Wilson is still Commander Sturgis’ prisoner, but a promise of freedom comes from an unlikely source. Will his liberation cost more than he’s willing to pay? Caught up in their personal battles and focused on our war with the grey aliens, will any of them realize the true threat that looms over us all before it’s too late? H.A.L.F. : The Makers written by the fantastic, and award winning author, Natalie Wright starts off strong and striking with amazingly descriptive writing. The story follows two groups of protagonists, Erika, Ian, Dr. Randell and Tex taken via the Grays, an alien race who hosted a massive aura of mystery. Tex is being held separate from the others. The group believes themselves to be on an alien ship. However, Tex has information that could show otherwise. The aliens rejected Jack and left him on earth to the group’s confusion, while Commander Sturgis, starting off with a messy confrontation with her superior, holds knowledge of what’s to come. Every character has a defined purpose and is finely crafted; each plays their role, with unique perspectives and interesting points of view. The writing is incredibly descriptive and sets the scene for each character. However, there is a lot of switching back and forth between different characters that made the story hard to keep in perspective at times. On the other hand, the way the author meticulously develops the mystery throughout the story, and how carefully crafted each character is, kept be glued to the pages. They were like finely ticking cogs working towards the bigger picture. The opening segment was one of the most captivating pieces I’ve read in a long time, the detailed description of Erika inside the alien ship was fascinating and had me hooked from the very first page. Most characters are written in a very personal way that make them feel real and make it easy to understand their fears, pride, and personality. The pacing of the story helped drive the mystery and allowed time for characters to fully develop. H.A.L.F The Makers has a fantastic story, filled to cover to cover with excellent description and brilliant creative freedom. Personally, I knew I was going to finish the book from cover to cover the moment I read the first chapter. A short prologue would have been a welcome addition for new readers. But none the less, pure passion and creativity eased me into the story, and before I knew it, I was heavily invested. There Really Are Human-Alien Hybrids? H.A.L.F. tells the story of H.A.L.F 9, a Human-Alien Life Form that escapes from the military facility where he was created. What was your inspiration for this imaginative and thrilling novel? The original idea and plot for this story came to me one day as I was driving in my hometown of Tucson, Arizona, listening to a techno-rap song called “Cowboys and Aliens”. What can I say – it was a hot day in the desert! I’ve long been fascinated by the remote area in southern Arizona, the borderlands between Mexico and the U.S. There’s a military testing range out there and not much else. That song on that day got me thinking about how alien conspiracy theorists talk about a secret underground base. And I thought what if such a base is under the missile testing range? And what if there really are human-alien hybrids? And why would a shadow government want to create such a being? The series has been great fun for me, a huge X-Files, Twilight Zone and Star Trek fan. Fun to create my own alien worlds and adventures! H.A.L.F. 9 forms a bond with other teens that he comes across and their relationships are dynamic and deep as well. What themes did you try to capture when you were creating the relationships the characters had? When I write a first draft, I generally don’t think about themes. I also don’t spend time outlining relationships before I write. I try my best to let the characters “speak” and for the relationships to evolve organically. But once the first draft is written, with the assistance of my content editor, I fine tune. In The Deep Beneath, I had not originally intended for H.A.L.F. 9 to become romantically interested in Erika. But he’s a 17 year old guy who’s never been around girls his own age! Of course he’s interested in her! As for the three human teens, I spent a lot of pre-first draft planning time creating a relationship backstory for them. On the advice of an early editor, I decided to have Erika and Jack having problems in their boyfriend/girlfriend relationship right off the bat. That’s not a typical starting point in a YA book and I think it was good advice. Over the three books, readers get to see complex relationships play out. And I think that’s more like what life is really like. Even with people we love deeply, we don’t always get along. There are ups and downs. But will we stick with someone through thick and thin? Or bail on them when the going gets tough? Ian and Erika are best friends. Like many best friends in coming of age stories, their relationship is tested by the difficult circumstances they’re thrust into. The circumstances of the story force them to journey beyond their small town and into the wider world. And oh what a world they step into! They each are confronted with moral dilemmas and the choices they make affects their relationship. What emerges is a story that over the 3-book series is about loyalty, trust, and having each other’s backs. Not only do we see this in how the three older teens deal with each other, but also through how Erika is teaching H.A.L.F. 9 about living in the human world. As I’m just finishing up revisions on the third and final book in the series, ORIGINS, I’m going to miss these characters! I’ve enjoyed writing their relationships and watching them grow. H.A.L.F 9 has telekinetic and telepathic powers which make him a valuable asset to the government. These powers are used in unique and interesting ways. How did you handle the use of these powers in the novel where they were believable yet useful? I was inspired to give H.A.L.F. 9 the powers that he has from my research into a real top secret military project called Project Stargate. It was started in the 1970’s and the purpose was to research the potential of “psychic warfare.” This was during the cold war and they were seeking to create a “remote viewing” spy network but there was also this idea that enemies could potentially be taken out from thousands of miles away using only the mind. Of course they didn’t produce much in the way of results. The funding dried up and the program ended (allegedly ;-). These sorts of top secret programs inspired the story. What if aliens had stronger psychic abilities than humans, and if a human-alien hybrid was engineered to have the stronger alien psychic abilities, what could it do? Media often portrays aliens as having much more developed psychic abilities than humans, so I thought it would be believable for a human-alien hybrid to have these sorts of powers. Giving the hybrid being these abilities was like creating superpowers or a magic system. So I had to think of its limits. That led to a rather unique problem for the hybrid beings that acts as a limit on their “magic” and is, I think, one of the more unique aspects of the series. H.A.L.F. 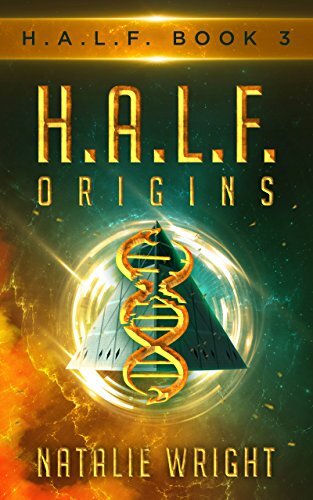 : ORIGINS (H.A.L.F. 3) will be available August 24, 2017! I’m so excited for it! It has been a super difficult book to write due to all the threads that spread out in book 2. But I think that readers will find the wrap up exciting and satisfying – and all questions will be answered! Erika Holt longs to ride her motorcycle east until pavement meets shore. She bides her time until graduation when she’ll say adios to the trailer she shares with her alcoholic mother and memories of her dead father. But a typical night in the desert with friends thrusts Erika into a situation more dangerous than she ever imagined. The two may need to forget their rules and training and if either is to survive the dangers of the deep beneath them. 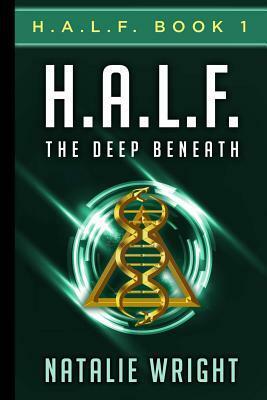 H.A.L.F by Natalie Wright tells the story of H.A.L.F 9, a Human-Alien Life Form that escapes from the military facility where he was created. During the course of his escape, H.A.L.F 9 meets teenagers, Erika, Jack and Ian, with whom he strikes up a friendship. Among other abilities, H.A.L.F 9 has extreme telekinetic and telepathic powers which make him a valuable asset to the government and one that they are not willing to lose. The government, claiming ownership of H.A.L.F 9’s life, sets out to retrieve him. Having no human technology that can match H.A.L.F 9’s power, they have to enlist a force stronger and more cunning than even H.A.L.F 9 is prepared to face. Right from the start of the book the characters are likable and relatable. Even though the first couple of chapters were a bit confusing, each one was intriguing enough to make me want to keep reading. It isn’t immediately obvious how the characters in the first chapters are related to one another, but once you do discover the connection the direction of the story makes perfect sense. The writing is actually done very well for a Young Adult novel; which the book appears to be, as all the main characters are teenagers. I was very surprised at how each chapter really kept me on the edge of my seat; my interest in finishing the book never waned. 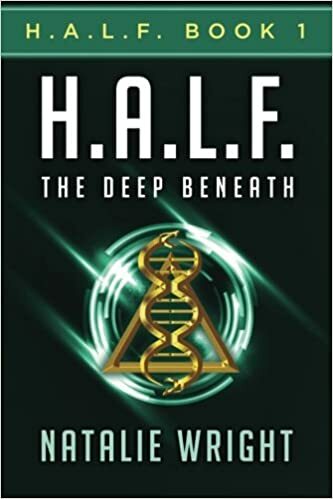 Most books have at least a few chapters that are somewhat slow but I didn’t find this to be the case with H.A.L.F., it kept a great pace and remained interesting throughout. I think the struggle within H.A.L.F 9 between his alien and human personalities were done incredibly well. Having spent hardly any time at all actually interacting with humans on a personal level, he isn’t quite sure what to make of the new feelings that he experiences outside of the facility. For instance, there is a moment at which he finds himself wanting Jack to feel pain, even though he can acknowledge that Jack has never done anything to deserve his ill will. H.A.L.F 9 isn’t able to recognize that he feels this way toward Jack because of Jack’s romantic involvement with Erika, whom H.A.L.F 9 is also developing romantic feelings towards. I also appreciated how this aspect of the characters relationships is subtle and not the focus of any particular chapter in the story. Sometimes Young Adult fiction does not have a good balance of romance to substance but this book does not have that problem. Natalie Wright does an excellent job with the element of surprise. I don’t want to give any spoilers so I will just say that in several places throughout the book the outcome that I was imagining is not at all what came to pass. I eagerly await the next installment of this series.